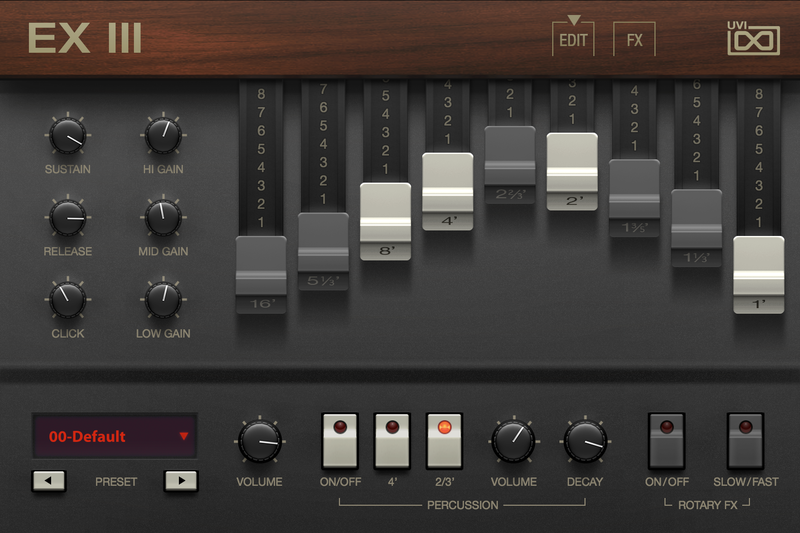 Retro Organ Suite delivers in a very raw and personal way the sounds that define a near 100 year legacy of electronic organ instruments. 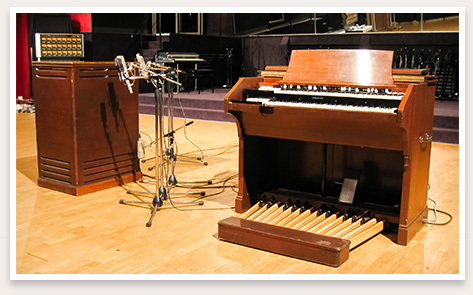 Dating back to the early 1900s, a small and specialized group of manufacturers first designed and produced these elegant instruments as low-cost alternatives to wind-driven pipe organs for houses of worship and homes of the social elite. 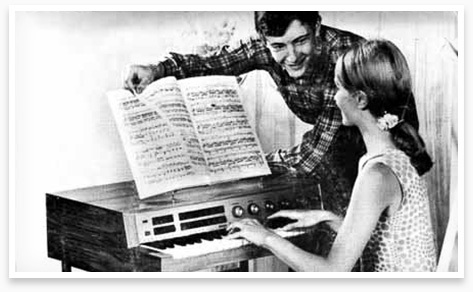 Later finding place in jazz ensembles, organs gained popularity in many genres of contemporary music through the mid 20th century. By the late ‘70s, due to the rapid pace of technological advancement and tastes, their popularity and commercial presence saw extraordinary decline. Since that time these instruments have seen some emulation in digital form, but their tangible beauty, the sounds of their raw mechanisms clad in wood and novel amplifiers have largely vanished, frozen in time on commercial recordings of old. 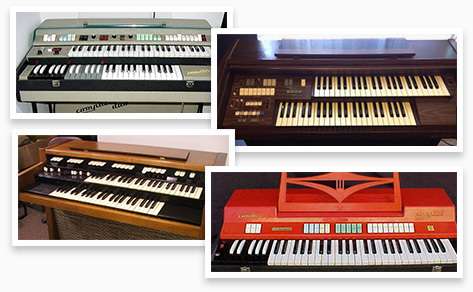 With Retro Organ Suite we aim to both present and preserve the original sound and majesty of this legacy in an uncompromising way, delivering 7 unique instruments that showcase what we feel are the best of best. Starting with factory-spec restored instruments we captured comprehensive sample sets, making sure to accurately document each instruments tonal range and natural sonic character. 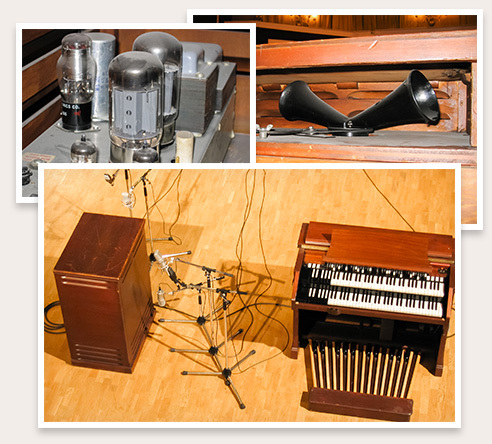 Recordings were made through the original speakers, rotary speaker cabinet, with vibrato, percussion, through D.I. boxes and through an assortment of vintage guitar amps. Top-grade microphones were used with well regarded preamps, along with a special selection of processors to provide the greatest degree of clarity and fidelity. 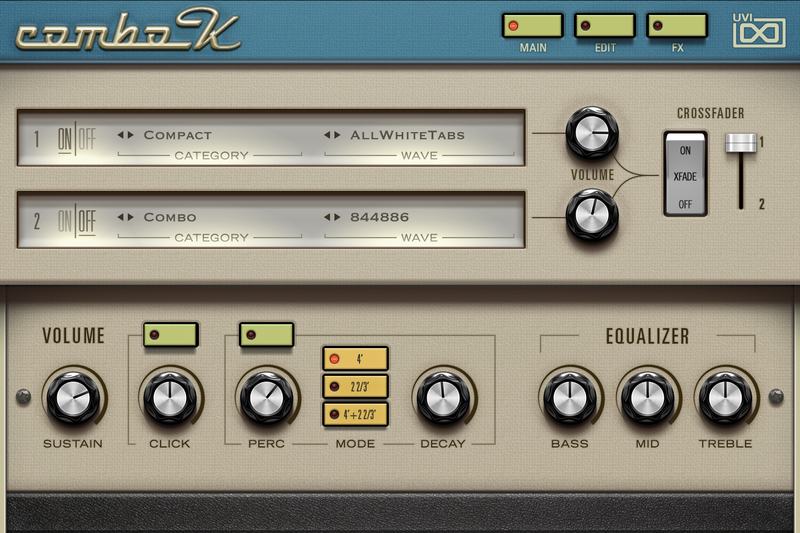 This tremendous sample base allows for a huge variety of tonal options in addition to a faithful preservation of typical recording setups used in years past. 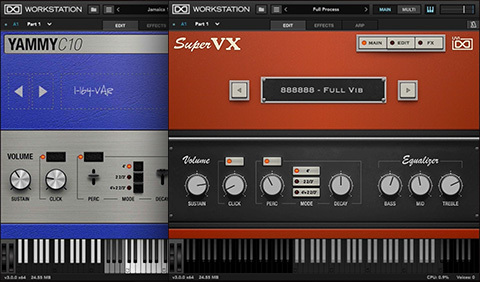 Leveraging these libraries within the UVI Engine™ hybrid instruments are created, providing you with both the natural and untreated sounds of the original hardware and the advanced sound design facility of a modern digital workstation. 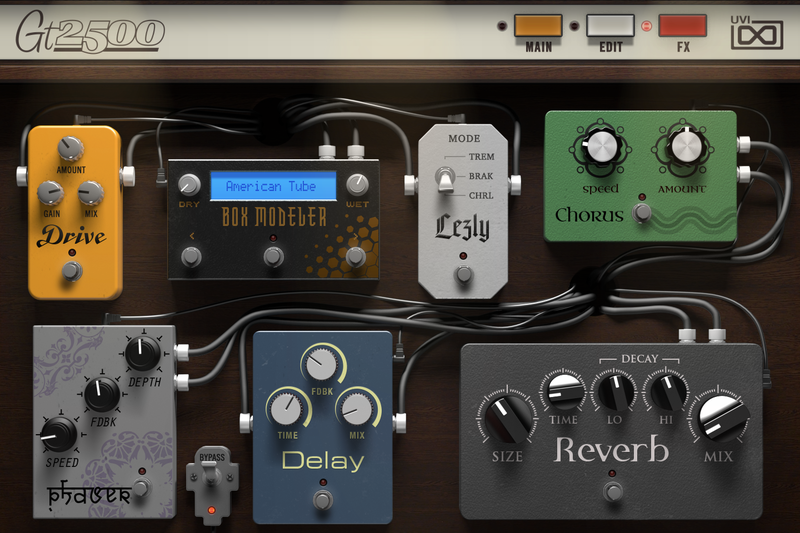 Sounds can be customized from subtle to extreme effect; shape your perfect organ, create a crushing vintage lead from a ’60s Italian combo, or build a brooding pad from a ’50s Hammond. The huge variety of samples presented can serve as both destination or starting point. 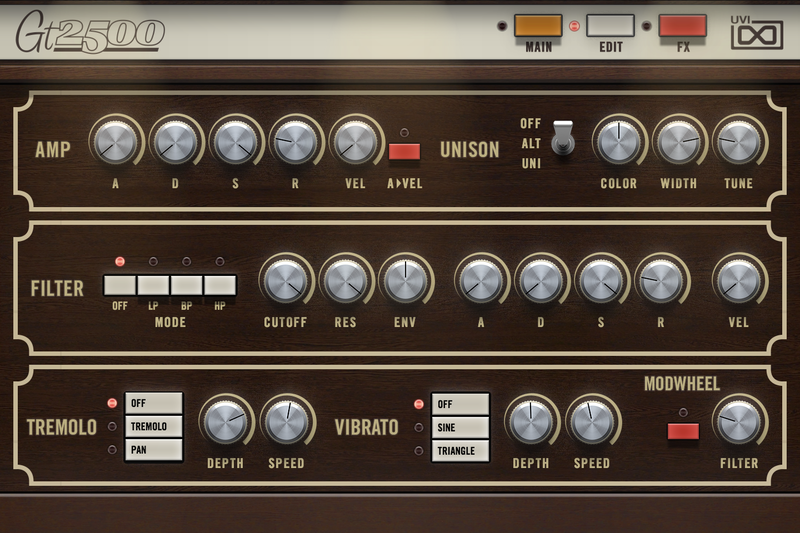 Retro Organ Suite version 1.5 introduces the latest generation of our Rotary effect, with DSP tailor-made to perfectly match the characteristics of a vintage unit. 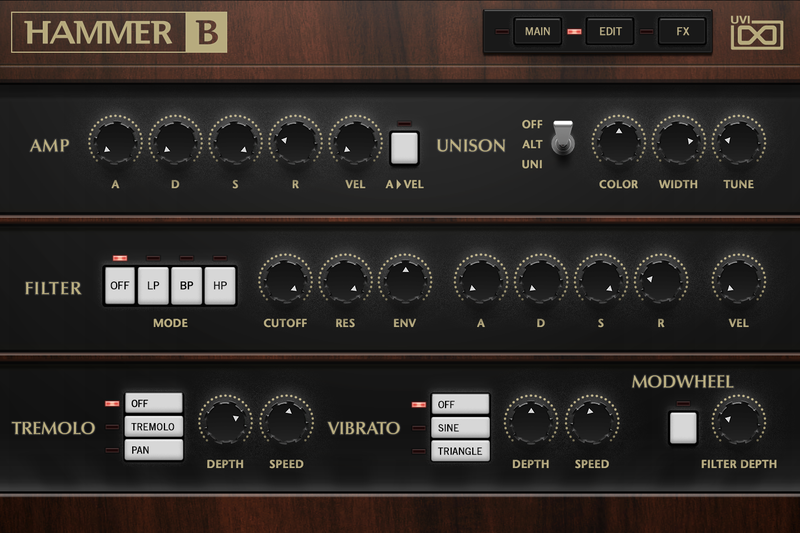 Using Falcon or UVI Workstation you can easily extend and elevate your organ experience. 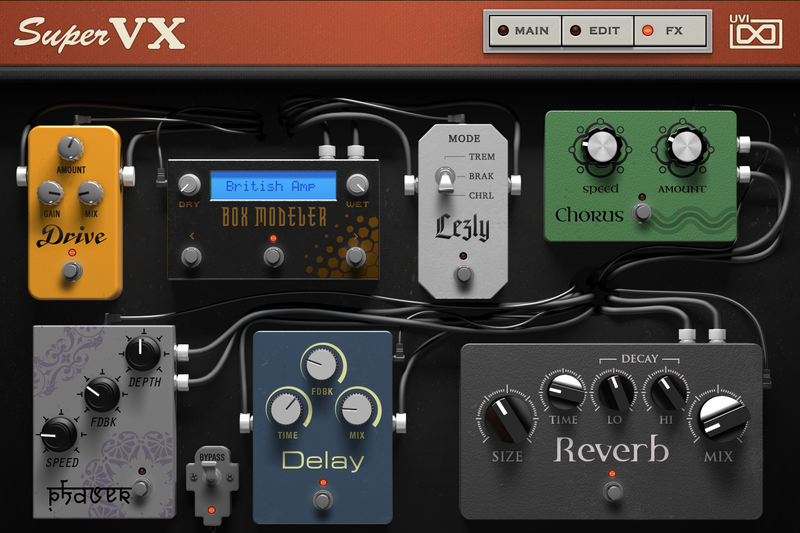 Instance as many instruments and pedals as you like and customize the key ranges of each instrument specifically. 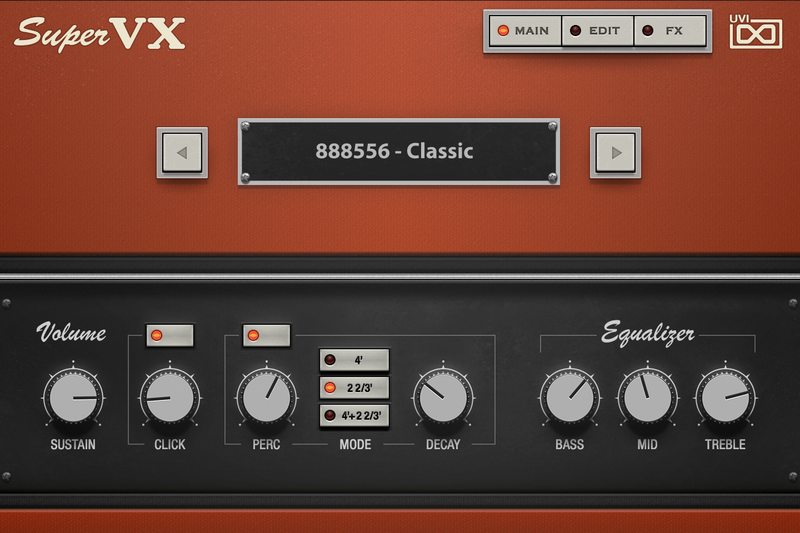 You can also, for example, set your upper keyboard to play a Super VX solo and your lower keyboard a Hammer B, then sweep in a sound from the GT2500 with a pedal. 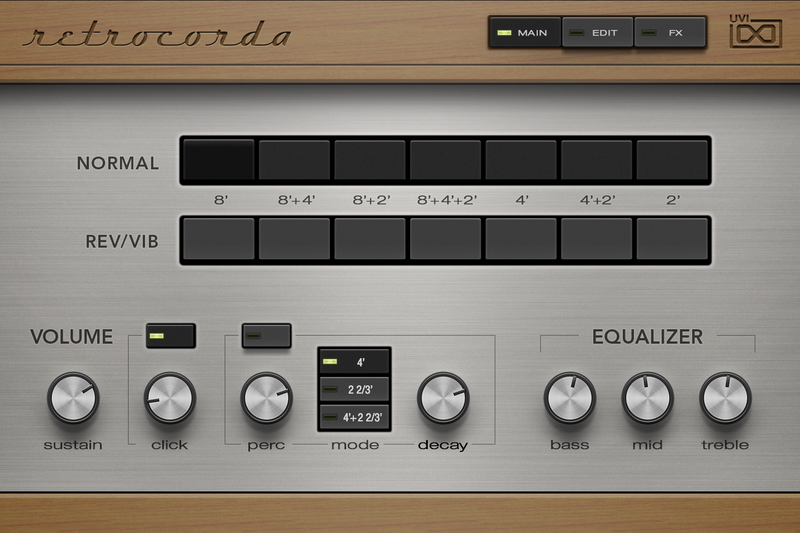 Configuration is simple and intuitive, and all controls support MIDI-learn. 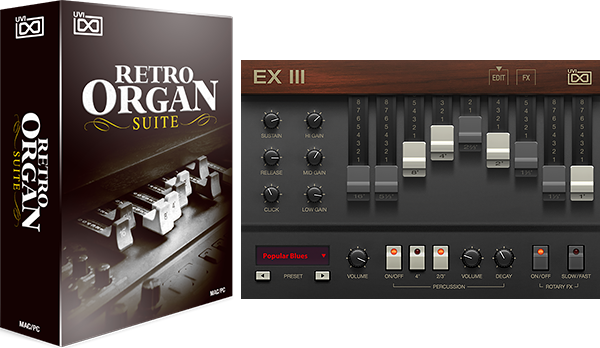 Retro Organ Suite fully realizes the original soul of these instruments in beautiful detail, and provides a platform for them to move forward into the 21st century. 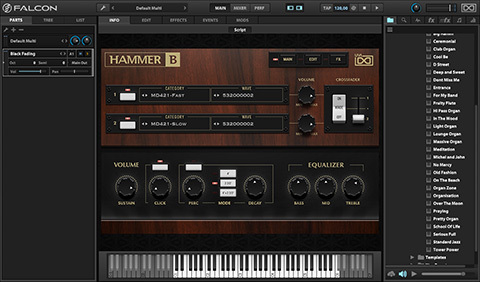 Arguably the most famous tone wheel organ and rotary speaker cabinet ever produced, Hammer B was created with a vintage 1950s Hammond B3 and Leslie rotary speaker. The instrument is easy and intuitive to use with dual-layers providing motion between fast and slow Leslie settings. 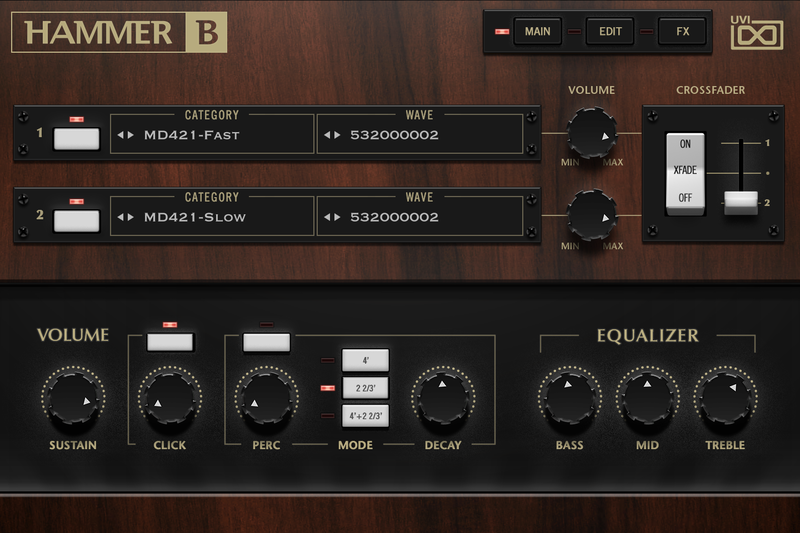 A natural preservation of the original, down to the pedal sounds, conveys a warm tonality and rich sense of history. 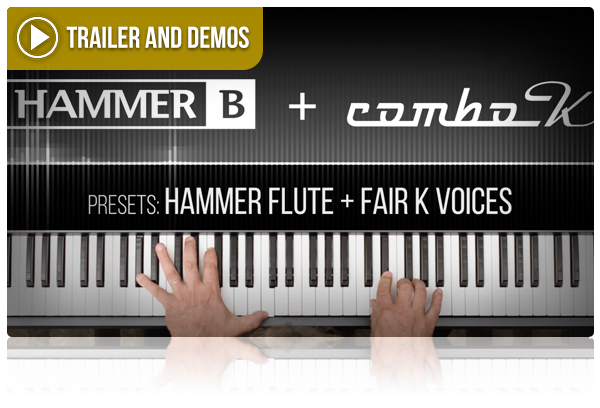 Based on a 1979 KORG CX-3, this instrument provides the control and experience of real drawbars. 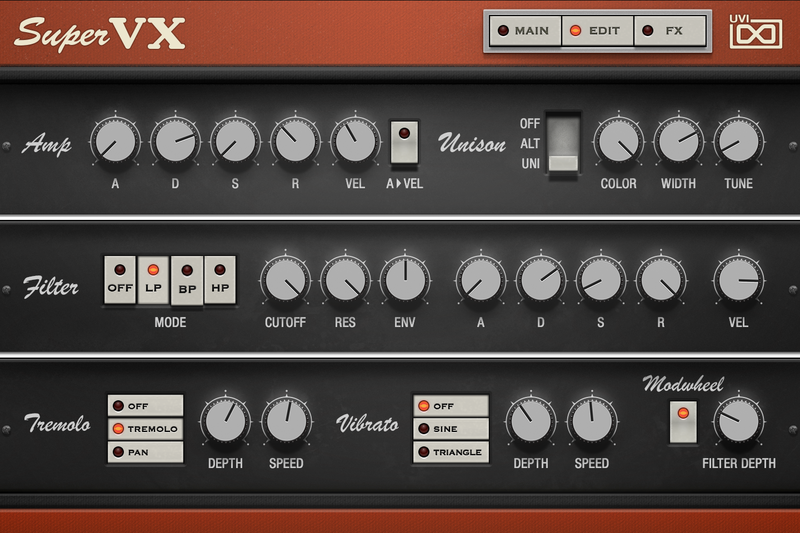 EX III leverages several advancements to the UVI Engine™ including our new high-quality rotary cabinet emulation and wavetable oscillator. Tons of ready-to-use presets, extremely fast loading times, and deep editing capabilities combine to make a versatile and hard working instrument. 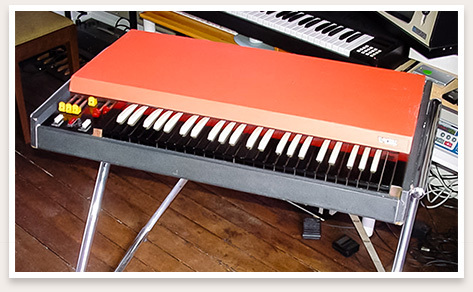 Created with a pristine 1960s Vox Continental, a transistor-based combo organ, Super VX offers a choice selection of the most musical and interesting drawbar combinations. 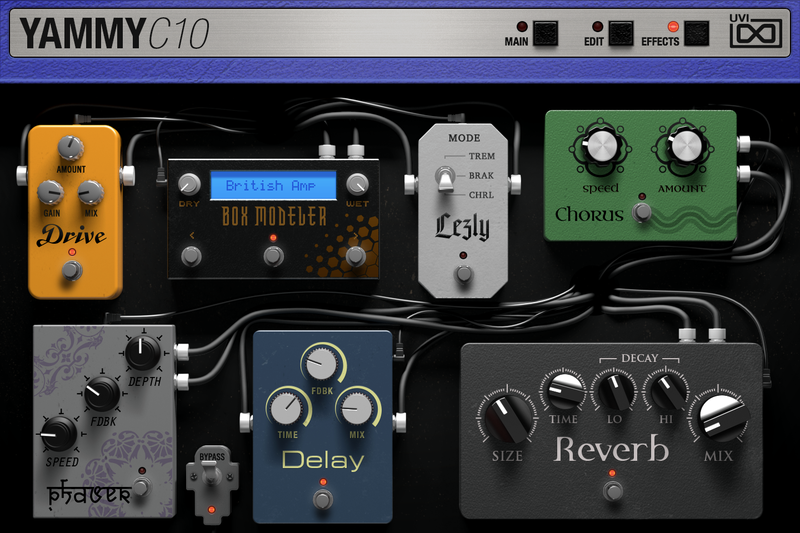 A widely used model, many familiar sounds will be found here. Easily invoke moments of nostalgia or thrust the airy tones into the future using the extensive Edit and FX sections. 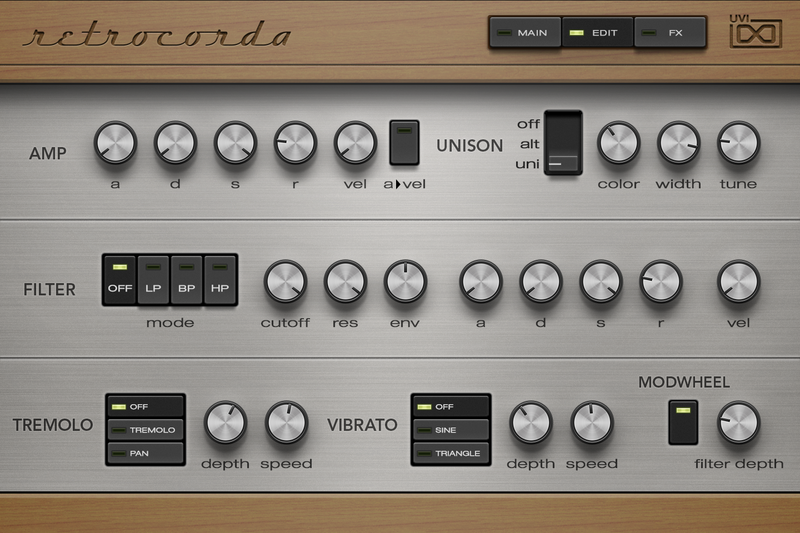 Based on one of the smallest electric organs, Retrocorda was created with a classic 1960’s Philips Philicorda. The particular model used was tube-based, creating a relatively warm and smooth sound that we find particularly compelling. Clarity of the recordings is immediately visible as is a distinctly vintage tonality. 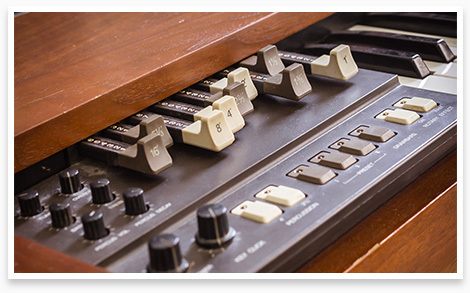 Created with the Eminent Grand Theater 2500, our GT2500 covers a huge range of sonic territory, from classic strings (an ancestor of the Solina string machines) to big organ stacks, percussions and more. 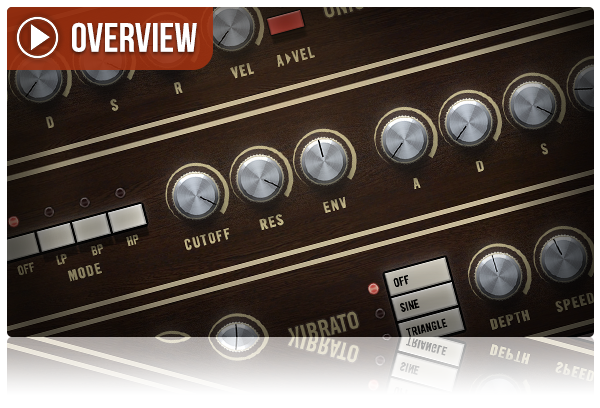 GT2500 represents the first appearance of these sounds in software form. 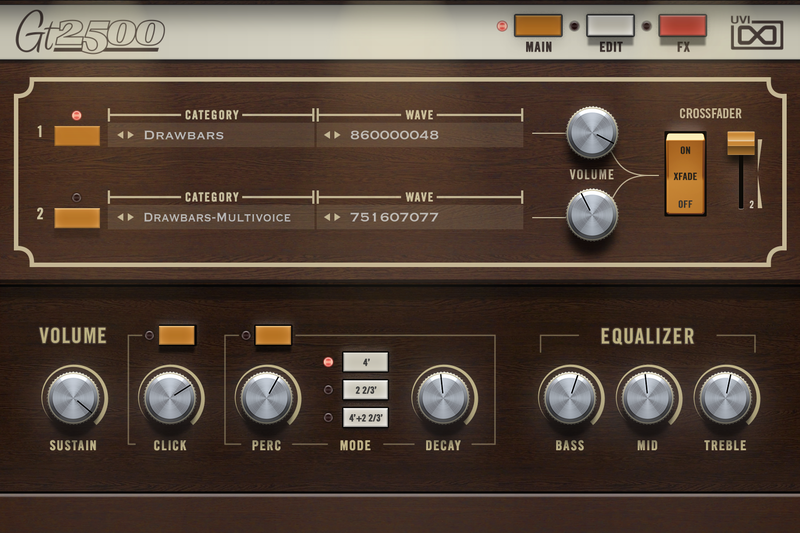 Additional recordings were made through onboard effects such as the spacy ‘Orbital’. 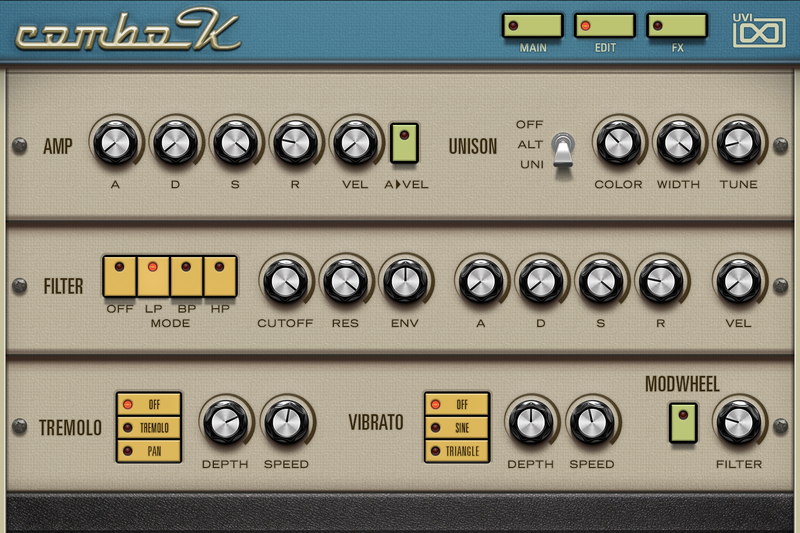 A combo instrument in itself, Combo K represents 5 combo organs (the Farfisa Compact Duo, Combo Compact, the Elka Classic, the Phillips AG7500 and the Hammond M100), representing the more affordable options of their time. 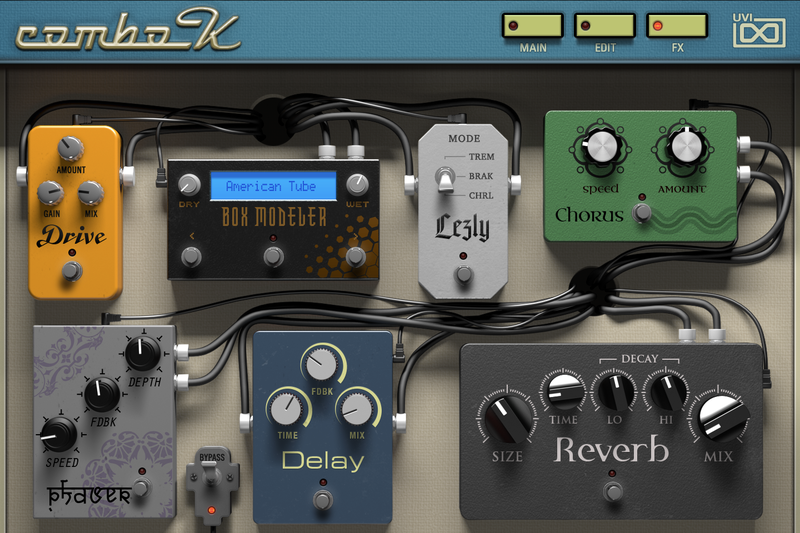 We find that many cool and unique sounds can be found in unexpected places and Combo K is no exception. A diverse and irresistible selection of sounds that can be exhaustively customized. 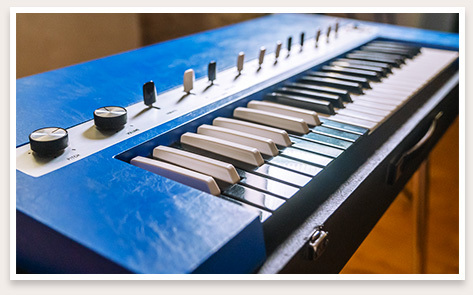 Based on a fully-restored 1970s factory blue Yamaha YC10 combo organ. 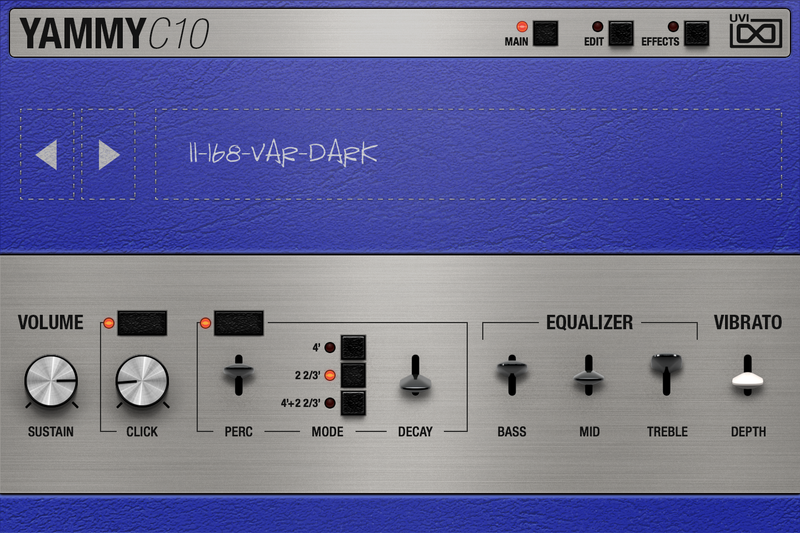 Yammy C10 delivers the authentic, charactered sound of this iconic stage keyboard including nearly every possible hardware configuration of the original. 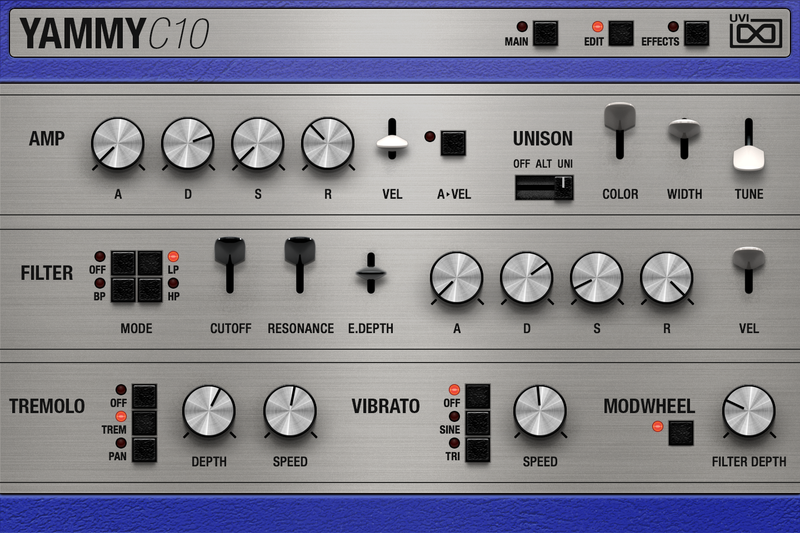 Deeply-sampled, full of subtle imperfections and tremendous when running through the Rotary effect, Yammy C10 is an expressive and organic sounding instrument. 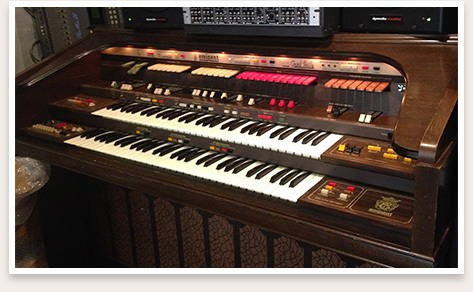 Farfisa, Combo Compact, Compact Duo, Hammond, M100, B3, Philipps, Philicorda, Korg, CX3, Vox, Continental, Eminent, 2500 Grand Theatre, Yamaha and YC10 are trademarks of their respective owners. UVI is not affiliated or endorsed by any entities listed here.